Arrive Delhi by Air or Train. Arrive at bus stand, Travel overnight in Volvo bus from Delhi to Shimla. Pick up from Shimla bus station & drive to hotel, on arrival check in hotel, afternoon / lunch excursion to sightseeing of shimla city, Vice Regal Lodge Heritage place and apart from the majestic building, it has well maintained lawns, Annadale the most picturesque place ,bottom of the city, & evening excursion to famous Mall Road in Shimla, is a place which cannot be left untouched by any visitor, the lifeline of Shimla known as, "Shimla heritage walk", Mall road is the main tourist attraction in the town. The Ridge : This large open space in the heart of town presents excellent views of the mountain ranges, Lakkar bazaar a famous wooden market of wooden gift items and back to hotel. excursion to Mashobra,Naldehra, Mashobra is a beautiful village that lies on the road leading from Shimla to Naldehra, The entire valley is covered by dense woods of oaks and pines. One of the greatest places to visit at Mashobra is the Goddess Durga temple. Mashobra attracts tourists for its utmost . The well known Craignano, fruit research institute, Naldehra is the site of the the oldest golf course in India. The beautiful golf course at Naldehra was the brainchild of none other than Lord Curzon-a viceroy of the erstwhile British Raj. Naldehra got its name from a Nag temple situated inside the golf course. Tall deodar trees surround the links making it one of the most beautiful golf courses in the world evening back to hotel and stay. In the morning checkout from hotel & drive to manali in-route Pandoh Dam on Beas River, Kullu. Kullu is world famous for its handicrafts items, River rafting on beas river ( White water rafting can be organized)and Manali stay at hotel. 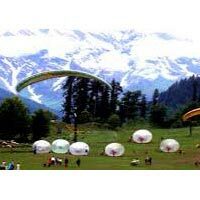 Manali-Rohtang pass sightseeing. Excursion to Rohtang Pass. 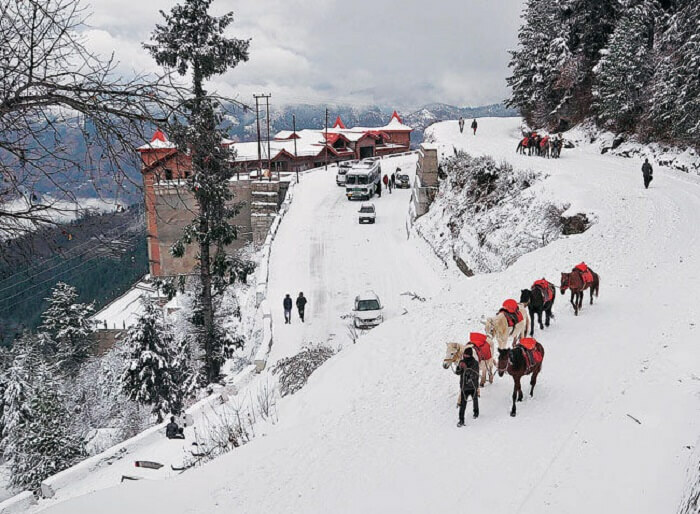 (up to possible) Situated at an altitude of 3979 mtrs above sea level and 51 kms from Manali is the mighty Rohtang Pass - the gateway to Lahaul-Spiti valley. 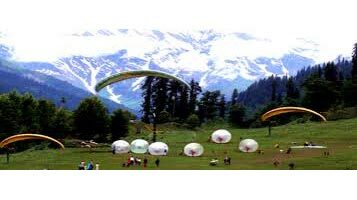 It affords a wide panoramic view of the mountains Rohtang is another adventure tourist site where it can be cold even on a summer day. Winds blow at furious pace,The visit to Manali is incomplete if you do not go to Rohtang Pass in route visitssolang valley, Kothi a beautiful and last village of kullu district,Vashist Hot Water Spring,Vashist is one of the important places to visit in Manali, The Place and Temple is dedicated to Vashist muni, the holy place and beautiful hot water spring, located on the way to Rohtang Pass, and back to hotel. In the morning / afternoon check out from hotel and excursion to local sightseeing of Manali, Hadimba Temple, It is located on a deodar covered hill in Manali, It is an ancient cave temple, Built over a huge rock, the sanctum is covered by three tiered roof of wooden planks, Tibetan monastery The colorful monastery is famous for its carpet-weaving unit where the residents, the immigrants from Tibet, produce handicrafts of various kinds that attract the tourists towards it and explore local markets of Manali. and evening drop at Volvo bus station for overnight journey to Delhi with sweet memories tour, Happy Ending of Tour. a) The above itinerary is suggested tour plan. The company is responsible for only those services which are charged from the guest. All other services which are not paid by the guest to the company are suggested services and company is nowhere is bound to provide that service or pay the cost for the same. b) Check in and checkout timing of the hotel will be according to the timing of the respective hotel. c) Company is not responsible for compensating any loss or additional cost incurred by the guest while taking the tour. d) Company is not responsible, nor liable for any damage, loss or injury caused to any passenger while taking the tour. e) Dollar rates are applicable only to foreign Nationals & Indians possessing foreign passports, while the INR package rates will be applicable to Indian nationals. f) All the disputes are subject to Shimla Jurisdiction only. g) Any claim to related to the package must be brought to the notice of the company with in a week. h) Rohtang Pass is subject to get Permission from State govt. no other charges/fare will be given by company. i) AC will be not applicable in hills.